Very thorough, quick, friendly office and professional. Dr. Arroyo and her associates are great practicioners. They leave no questionable spots go unattended. I have great confidence in them. I rate Dr. Arroyo a 10 on a scale of 1 to 10. Dr. Arroyo listens to me, I trust and agree with her treatment decisions, and she is the smartest and kindest doctor I’ve ever gone to. Dr. Arroyo is very patient and listens to you. She throughly looked at my skin. I really liked her bedside manner. She took her time with me and I truly appreciate that. She even recommended items for my skin that were very affordable over the counter. I recommend her and her staff. I am never disappointed when I see Dr. Arroyo, she always listens when I ask a question or have an opinion. Very good bedside manner and knowledgeable. Dr. Arroyo and her staff were all professional and warm. I felt well taken care of. There was little wait, the appointment was quick but thorough including a biopsy and treatment. Couldn't be happier to have a place as a patient in their care!! I appreciate the listening and response. The office is professional yet warm Dr. Arroyo actually came out to the reception to greet me and take me in. I wish all offices were like this! There was no wait when I arrived for my appointment, and I was seen right away. I needed a couple of biopsies done, which were completed within about a half an hour. Excellent caring service by everyone involved. Dr. Arroyo is awesome! I recommend her and her practice. All went smoothly and well. Everyone was caring, kind, and professional. Extremely pleased with Dr. Arroyo’s care and warm and friendly manner. 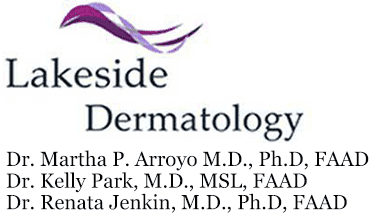 I have had numerous dermatologist deal with my skin issues and Dr Arroyo has been the best by far. I highly recommend Dr. Arroyo.